Temporary aar.li for Part 113 while we wait for Coiot/ Volpe to arrive. Enjoy! Good evening/morning/afternoon/whatever time it is where you live fellow CBR observers! 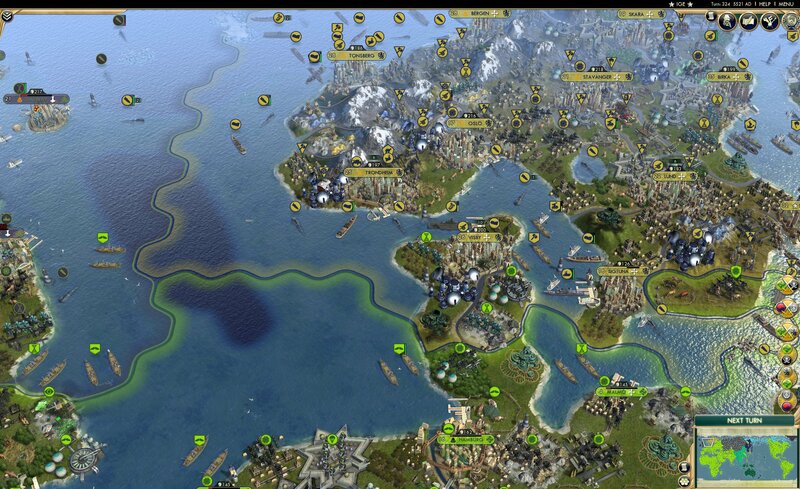 My name is u/Vihreaa, (map guy) and I have the pleasure to be narrating this week’s rendition of the Civilization Battle Royale! 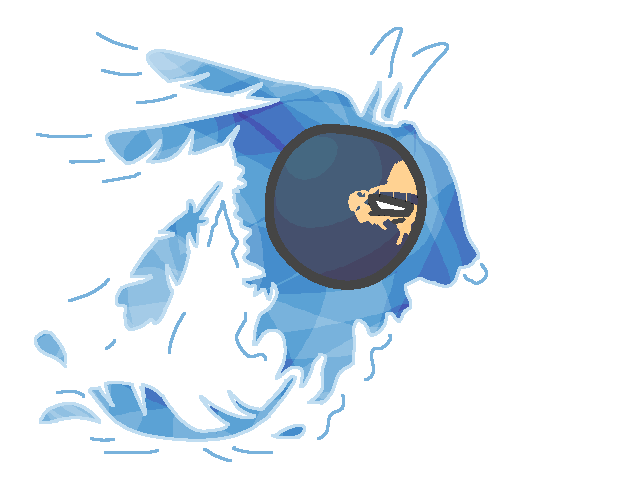 We start this week with our weekly showing of OC, which this week is the Ghostball of Crowfoot, created by u/Pizzarcatto. He without a doubt went down with a bang, reviving civilizations left and right. He truly deserves the name Necrowfoot. In a total upset, The Blackfoot take #1 in the Power Rankings this week! Wait, you’re telling me they’re dead? Oh…. But we all know nobody can. We are blessed this week with the beautiful map detailing the current state of the world, created by the ever so talented u/Vihreaa. All jokes aside, a map like this shows that anyone can become relevant. Here I am, narrating a part and having my map in the album! To all you lurkers out there, you too can become relevant, just like me! Our next map for this week is the usual installment of the Tile-Accurate map, created by u/DerErlenkonig, which is a staple of maps for the BR. 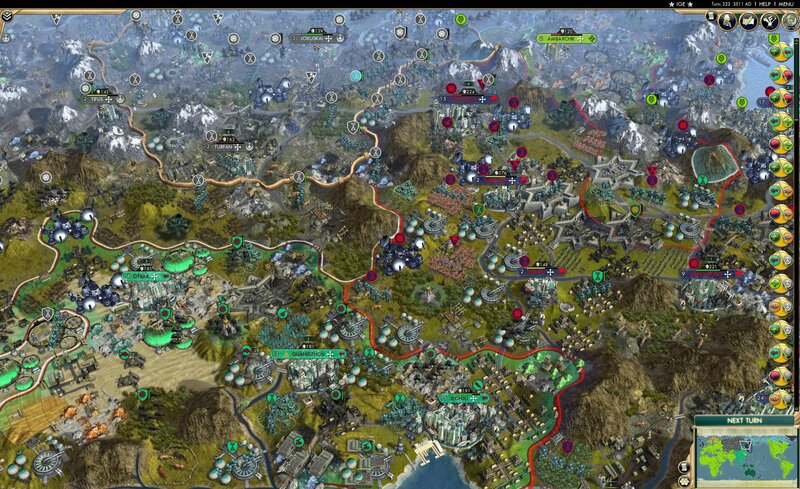 Showing off Brazil’s ever expansive expansion, Sibir’s progression into a rectangle, and much, much more, in the highly enjoyed tile-accurate format. 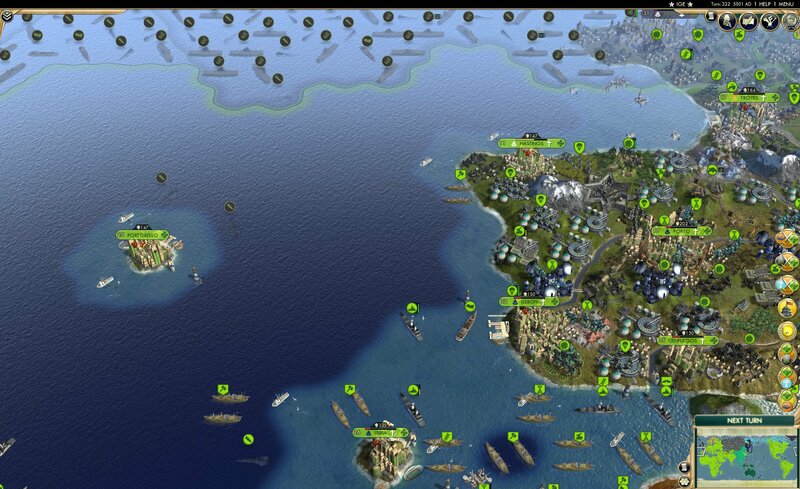 We start off today with Brazil’s capture of Portobello from Iceland. 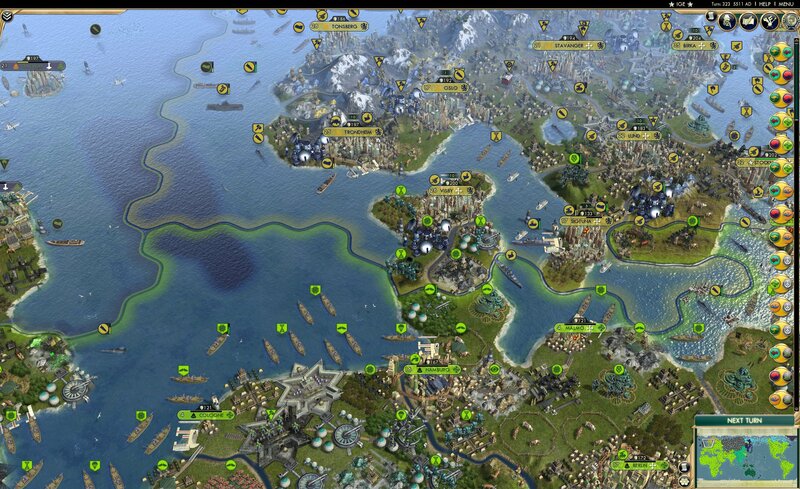 If you look to the right of the screen, you’ll notice that Iceland, the Boers, and The Inuit have all made peace with Brazil. Sorry guys, we’re in Total War™. 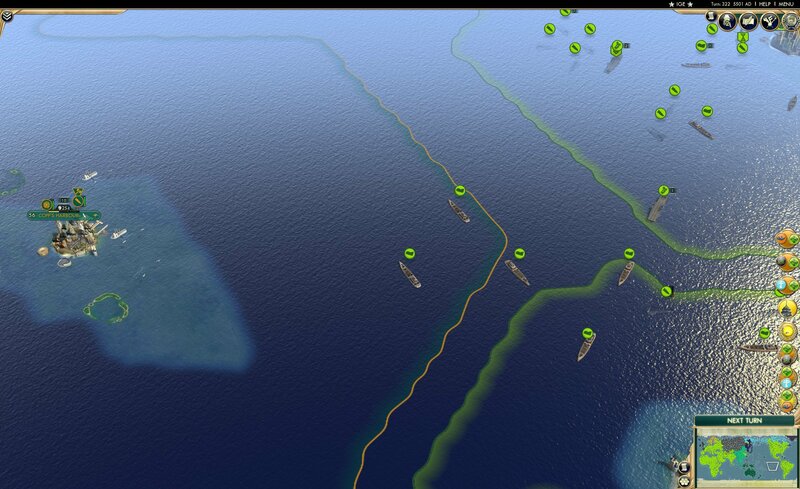 But with those peace deals, all invading troops are pushed out of enemy territory, as you can see with Iceland’s Big Carrier fleet in the north. In this slide alone, over 50% of Iceland’s navy shown are carriers. 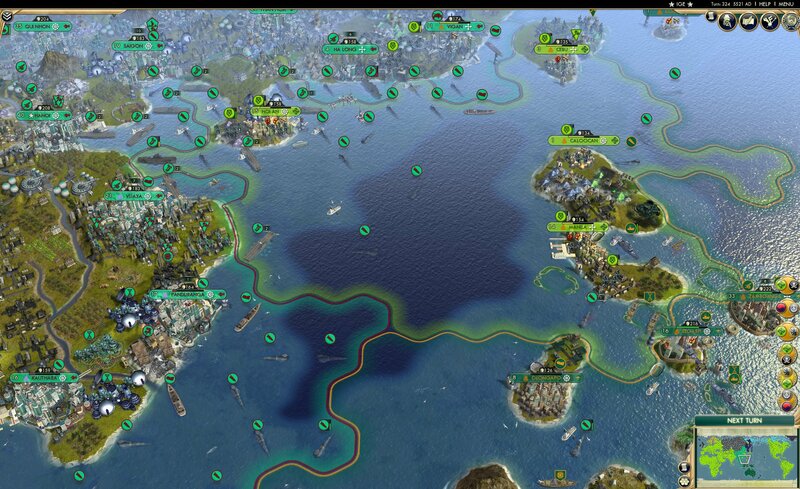 Moving to the Swedish front, Sweden has done a fine job on defending against CARNIVAL, with no city captures this turn. I will applaud Sweden for how well they’ve held up against Brazilian party-goers, although Brazil may not even be pushing very hard on this front for all we know. Things have come to a temporary standstill on Sibir’s Western front as well. Brazil is making a push East of Kharkov, but they aren’t really pushing into any one city, more so just the gap between three…. 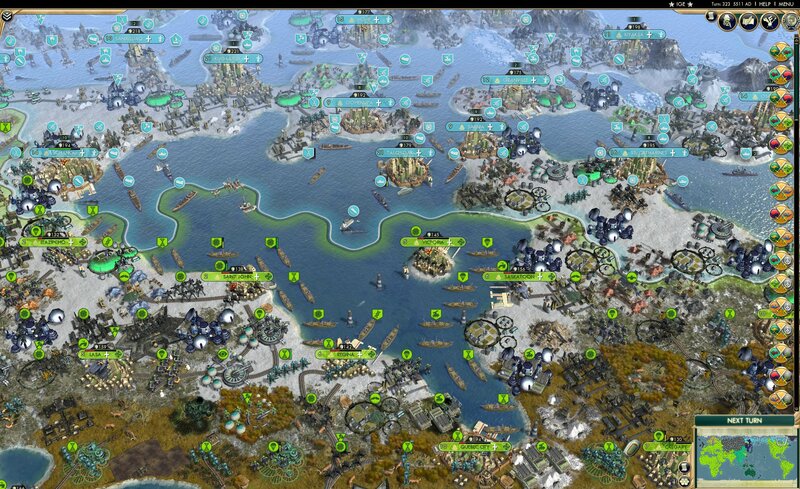 If Sibir can produce some more units and planes, I could see them retaking their lost cities from Brazil here. Chimgi-Tura has fallen, along with the hopes of Siberian supporters, as Brazil pushes through with ease what used to be a Vietnamese-Siberian meat grinder. Mini-Pedro is really not someone you want to mess with. 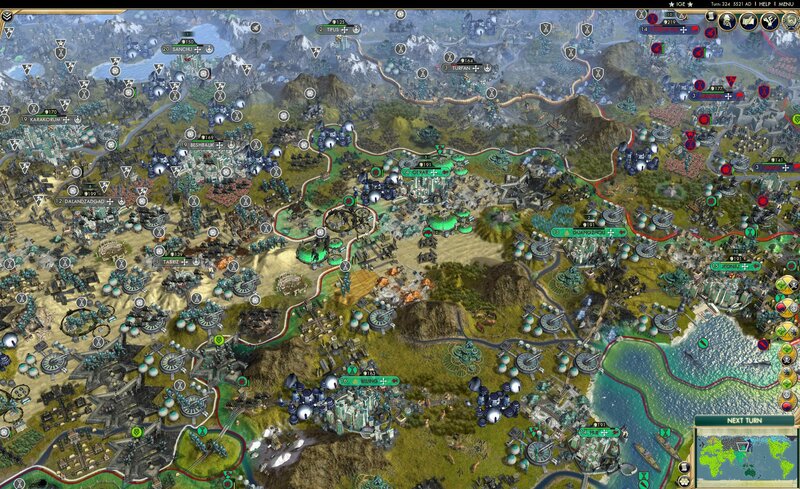 Sibir holds onto Samarqand, the former Timurid capital. Does anyone even remember when The Timurids were in the game? Pretty sure they’re before my time. Siberian troops march into Chamdo, facing only a Mech Artillery to resist them. Brazilian party-goers mosey their way over to Lhasa, but didn’t capture any cities on this slide. Could we see the possibility of a revival of Tibet? This seems to be a slow turn, huh Pedro? Maybe Mini-Pedro needed a quick break, and put Pedro II in charge for this turn. 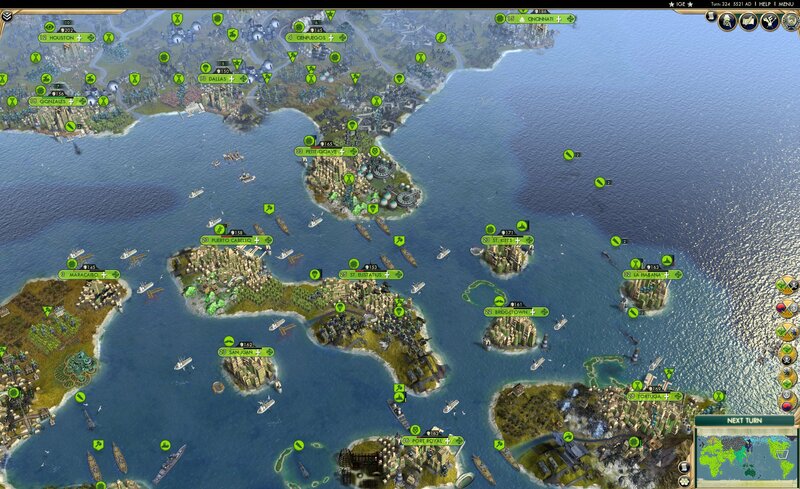 Vietnam’s cities on this front look fairly secure. They should be able to pick off embarked units with ease here. 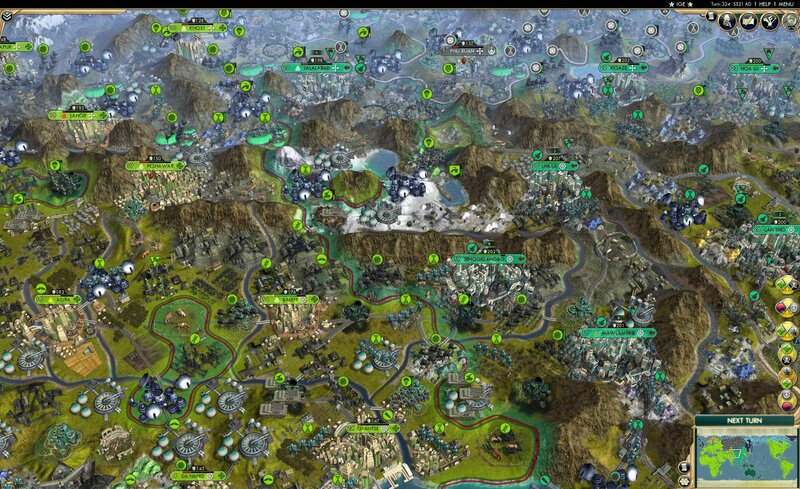 But even though Brazil didn’t push this turn, Hanoi can still be seen in the distance. The gap between the front lines and the capital shrinks every day. Imagine what is it like in Hanoi. Boer penguins begin to honk in their flippers as CARNIVAL approaches. It’s only a matter of time until the once mighty Boerg fall. Maybe if Kruger is lucky he’ll get a spot in Pedro’s zoo in Rio de Janeiro in the Penguin exhibit. 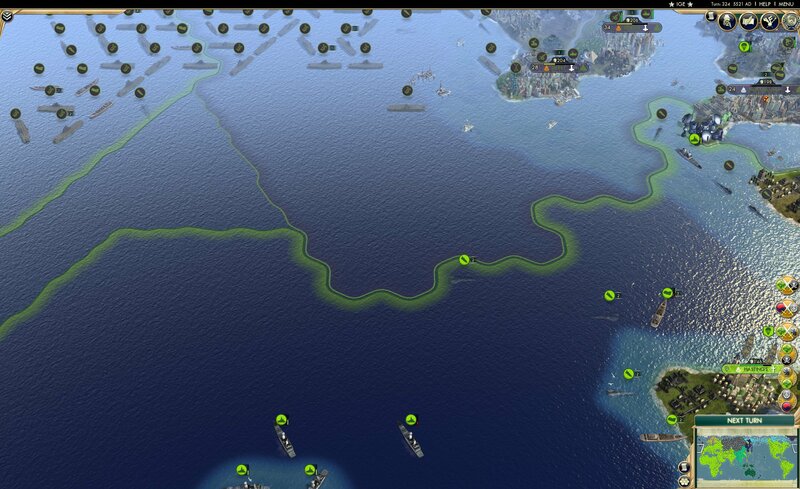 Vietnam retakes Jakarta, bringing along some beautiful border gore with it. In other news, Vietnam relentlessly continues to bomb My Son, but with no melee units nearby, the city looks safely Australian. Hang in there, little buddy. Henry Parkes flies by in his private jet, observing his beautiful and healthy cities. “Everything is fine.” He continues on his flight to Canberra. 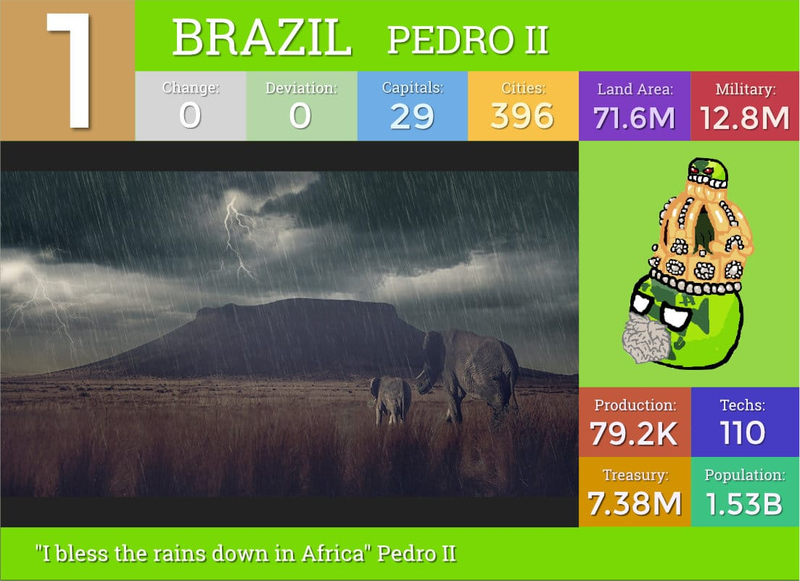 Meanwhile, Brazil captures more cities in Japan and China, purely for the reason to grow Pedro’s anime collection. Australia retakes Kyoto from Korea, and Brazil’s capturing of cities from Vietnam could be compared to a vomit green sword shanking a majestic green dragon. 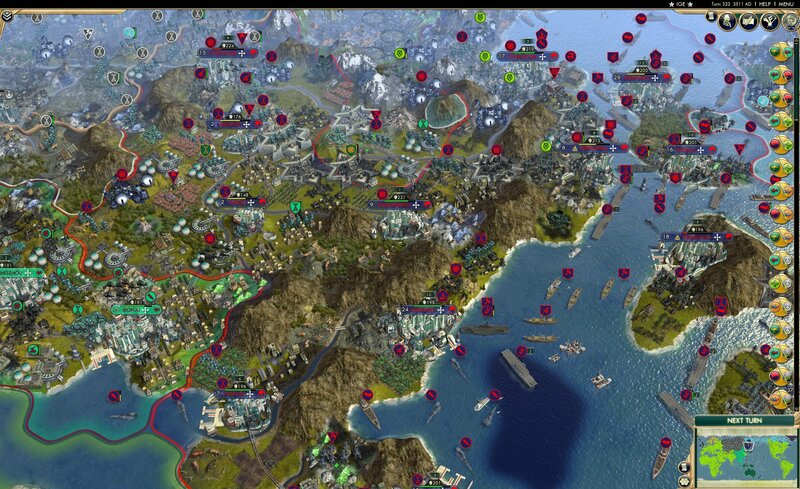 Seoul is also bombed into the yellow, but there doesn’t appear to be any troops nearby that could take the city. On the other hand, this slide is the closest we can get to where Mongolia’s final city was. Yes, you heard it right, Mongolia has been eliminated, in a huge upset that nobody saw coming. 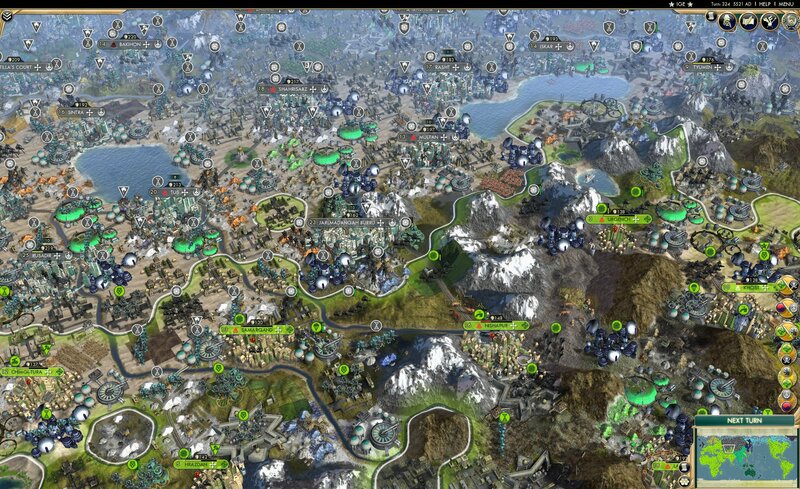 Mongolia, as one of the few Firaxis civs in the game, proved themselves to be quite resilient against other civs around the cylinder. He managed to hold onto his capital until just before the very end, where Kuchum Khan proved himself to be the superior Khan in the end. Finishing 11th, that is likely Genghis’s deepest regret, of not being able to finish in the top 10. Please Press F to pay Respects. 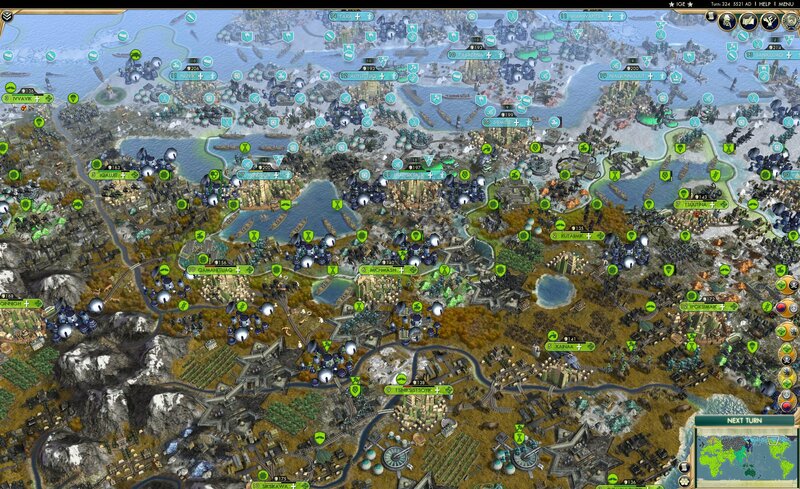 Korea hasn’t manage to capture any of the Inuit’s cities here, but they do show off a sizeable navy and airforce, with 62 Korean air units on this slide, compared to the White Walkers, who only have 33 air units, and whose provisional capital of Sanirajak is in the yellow. All of Australia’s Japanese holdings are in the black in terms of city health, but it looks like those cities will still hold for a while, with their formidable carpet of troops. The Brazilian-Australian stare-off continues, as Australia sends a carrier, and Brazil a Cybersub. Hate to break it to you Henry, but you just don’t bring a carrier to a submarine fight. 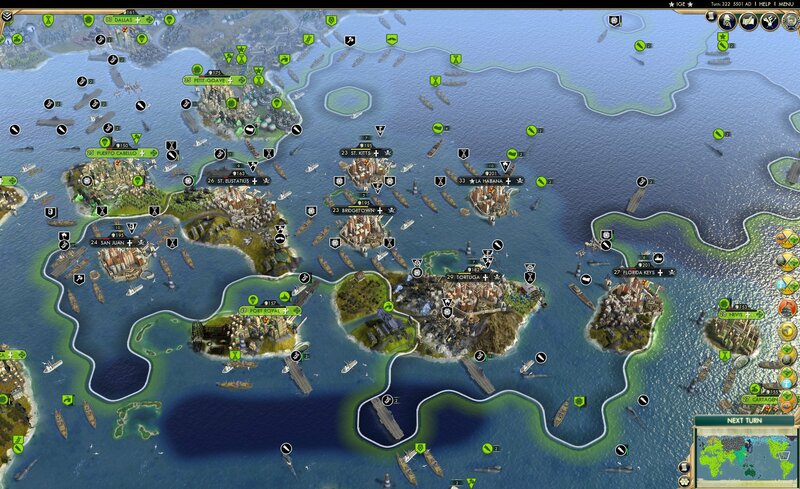 Through just seeing Brazil’s navy in the distance, almost 12 million citizens of Coff’s Harbor have died. Leaving the city at a still ridiculous size of 78.5 million people. Who even is this Coff? Why is he important enough to have a Harbor to be named after him? It looks like the city was named after John Korff, who took shelter there from a storm. I wish I could just name stuff like that. 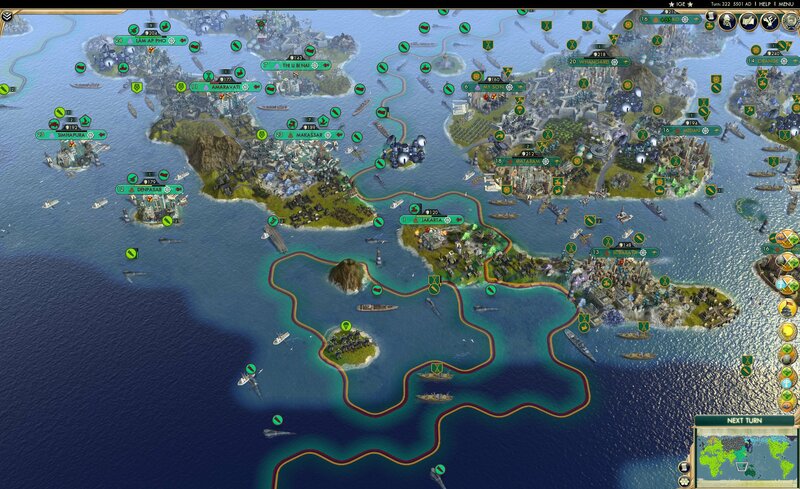 Brazil captures Hervey Bay from Australia, and the citizens of Bundaberg (that sounds funny haha) cower in fear as they cannot do anything to stop the endless spread of CARNIVAL. What’s this? Could it be? Brazil has lost a city? Australian troops valiantly retake Quandan, giving a big middle finger to Pedro in the process. Henry, in his drunken stupor, attempts to respond. “W-what? 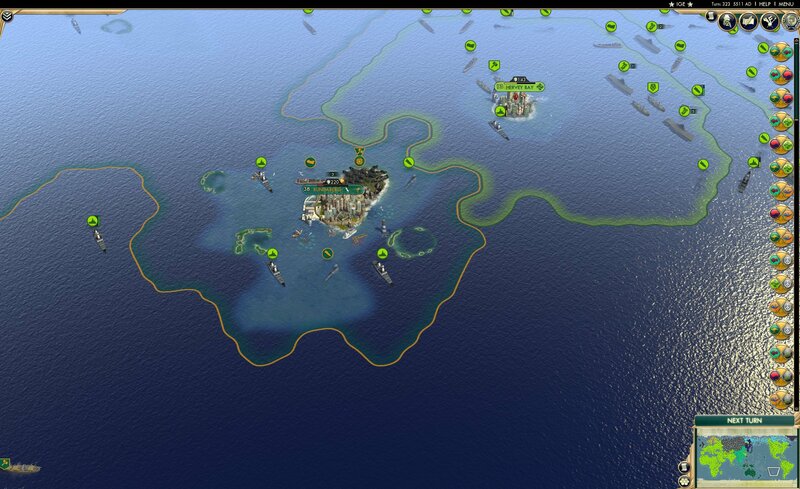 I thought Brazil was still stuck *burp* fighting the Inuit?” Henry stands up, and promptly collapses, too much rum. Henry’s advisors take Henry and escape to their provisional capital of La Habana, but their fate is sealed. 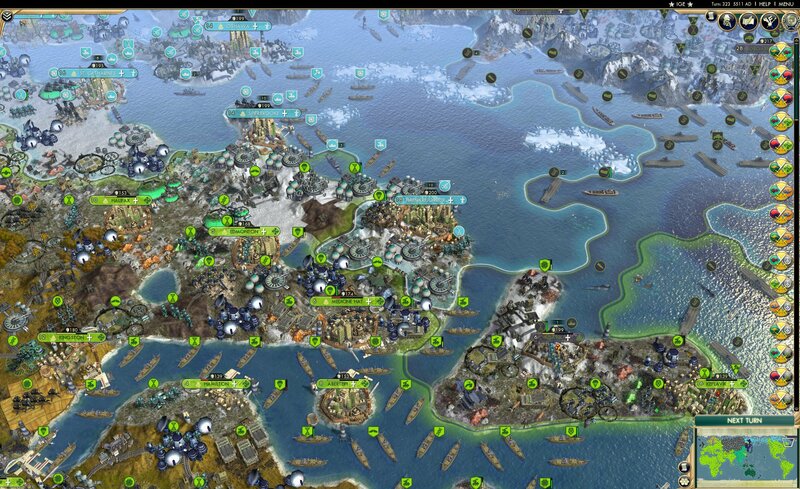 Iceland has miraculously managed to hold onto Newfoundland for another turn, against all odds. It’s the small victories that count, guys. 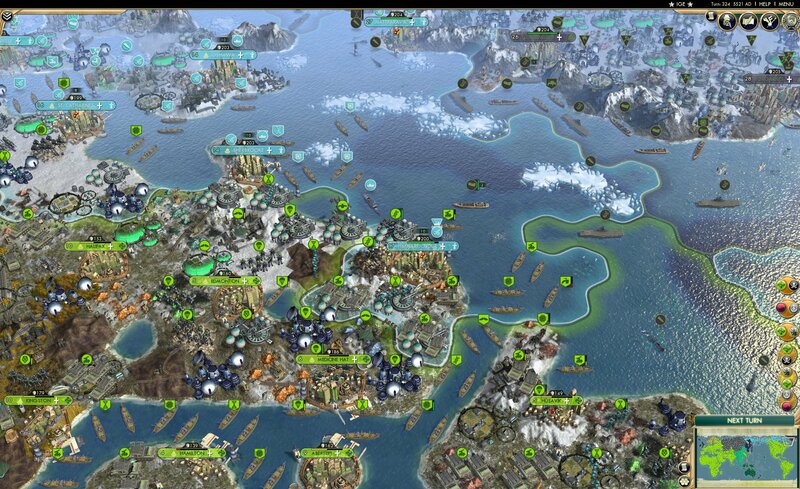 Brazil might be getting a little cold, with their progression of fighting the Inuit. The cold winds drown out the sounds of CARNIVAL. 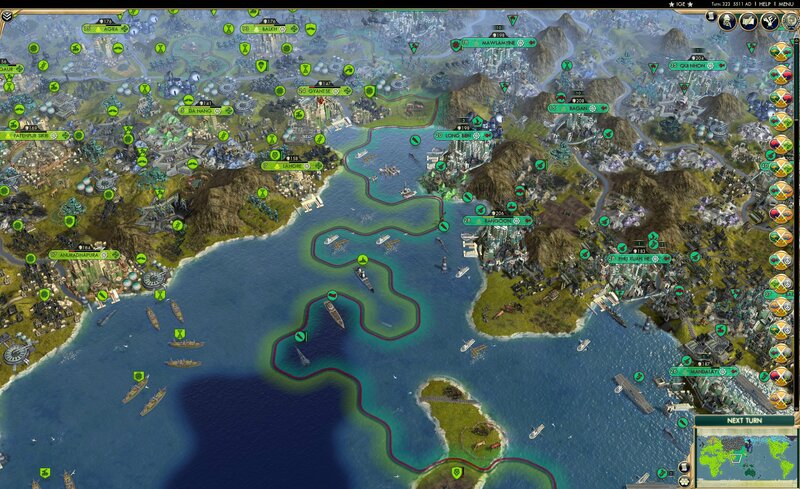 Brazil holds strong onto their captures cities though. With the split straight through the middle of Inuit territory, The Inuit stay strong in their divide between East and West. The Western Inuit core in Alaska seems pretty devoid of land units, but on the navy side of things they don’t have a problem. It’d be really great if they actually had melee boats so they could do something with their fleet. Iceland’s last stronghold of York has fallen to the CARNIVAL. Iceland is now purely an island nation, with no cities on mainland continents. *But wait! * That one guy says. Iceland still has one tile of land in Europe, in the bottom right corner! See! In this slide, we can really see Nebuchadnezzar’s power. Almost all nations of the cylinder have made attempts to make peace with each other this turn, but are barred from it, because of the ordained “Total War” coming from the sub. We are just forcing these nations to send millions to their death purely for our entertainment. And boy oh boy is it entertaining! 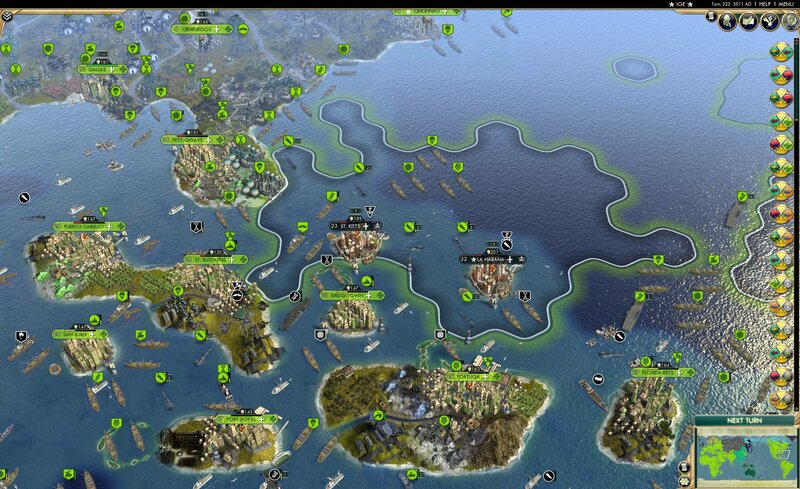 Brazilian troops continue to march into Swedish Denmark, surrounding the city, but Visby stands strong. Pedro has also made the controversial decision to embark a sizeable force of troops into the sea, heading either for England or Scandinavia. 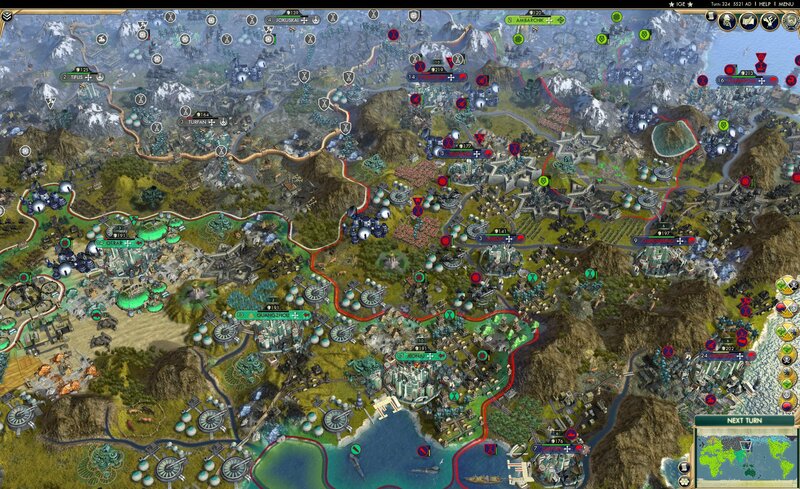 Brazil’s push of troops from last turn seems to have just skipped all of the cities we thought they were going to attack. Where are you guys going? Only Mini-Pedro knows. 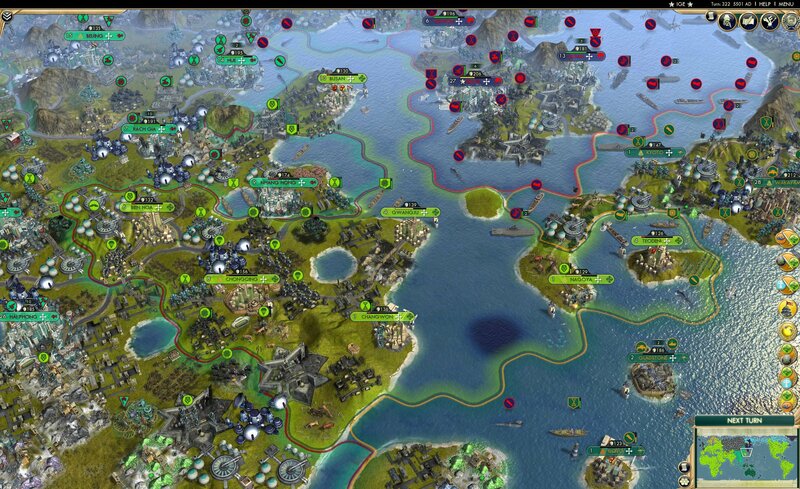 In the upper left corner Jönköping falls into the red, with Brazil just on their doorstep. 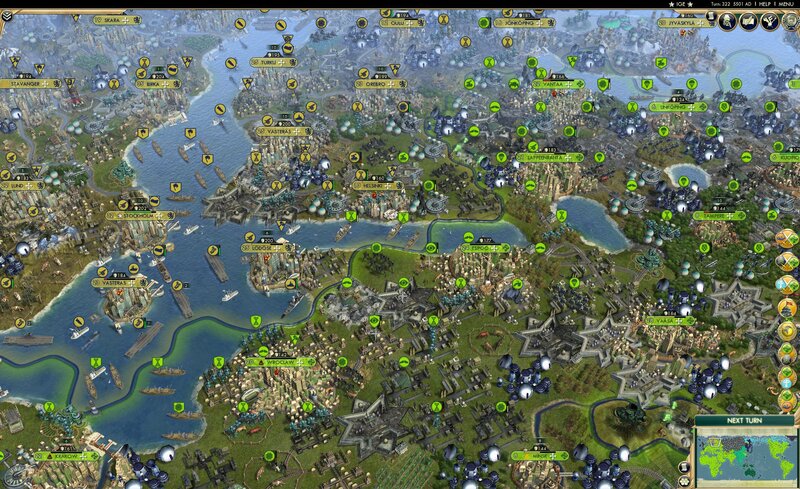 Sibir holds Samarqand for another turn, but we all know deep in our hearts CARNIVAL cannot be stopped. 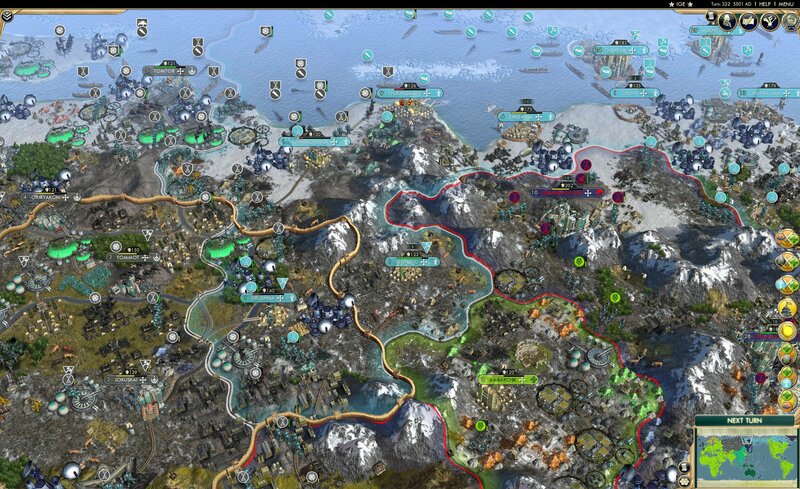 Brazilian troops begin to surround Urgench, which is likely to fall next turn, due to its low health. Brazilian party-goers vastly outnumber the Vietnamese on this slide, but haven’t captured any cities. 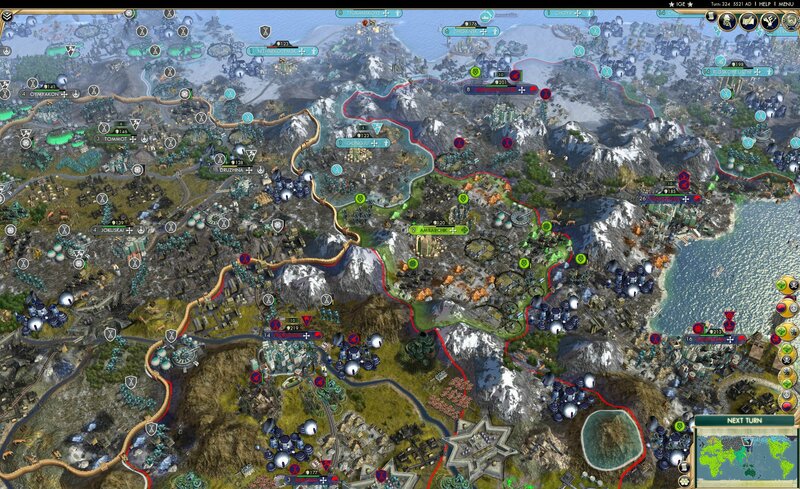 The mountainous region east of Brazilian Raj may prove difficult to take from Vietnam. "Between you and me, your army is kind of the laughing stock of the world." This is honestly what the world thinks of Vietnam at the moment. They still have a sizeable amount of land and production at their disposal, yet they have a country almost devoid of units. 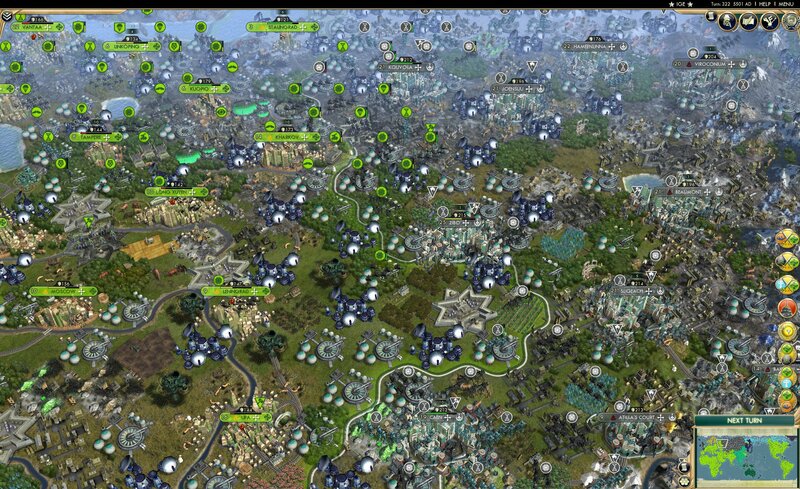 It is my prediction that Vietnam will be the next great power to fall. Korea just really isn’t in a good place right now. 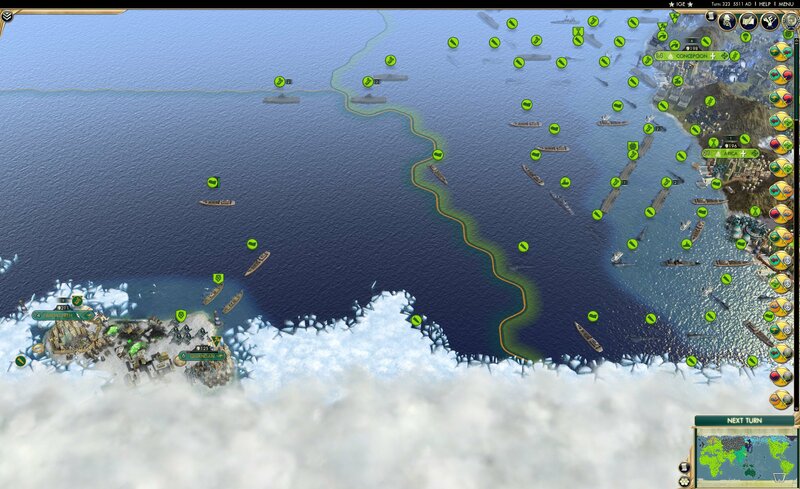 With Sibir approaching from the north, and Vietnam to the west, their days really are numbered. At least they didn’t instantly collapse like some other nations we know, *cough* Ekeuhnick *cough* Kruger *cough* Gustavus. 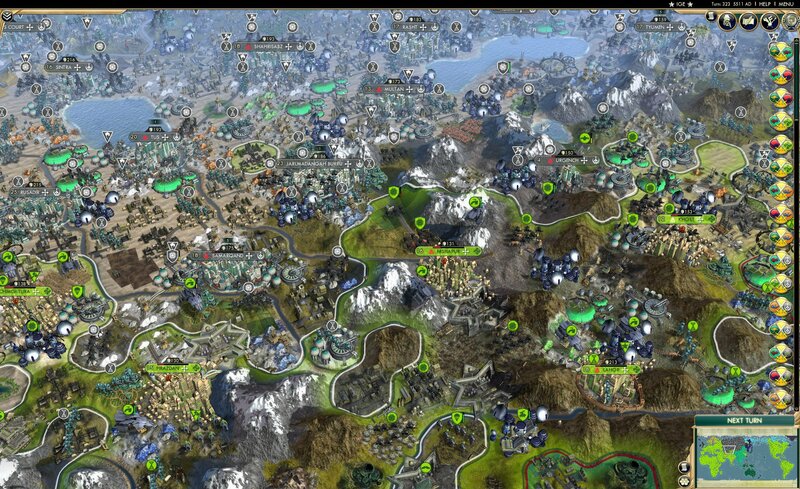 We get a good glimpse at Korea’s core here, save their capital of Seoul and some northern cities. While they do have a sizeable airforce, they really are lacking in land units, to defend themselves and capture cities with. Also, how does Hamhung have 12 air units in it? I always thought that the maximum was 10, and I’ve played through games with the future worlds mod. How odd. This slide does very well to illustrate why I have so little faith in Vietnam. Don’t get me wrong, I love Vietnam as a country and what they stand for, but they have so little units in this slide, and this slide shows so much of their core as well. 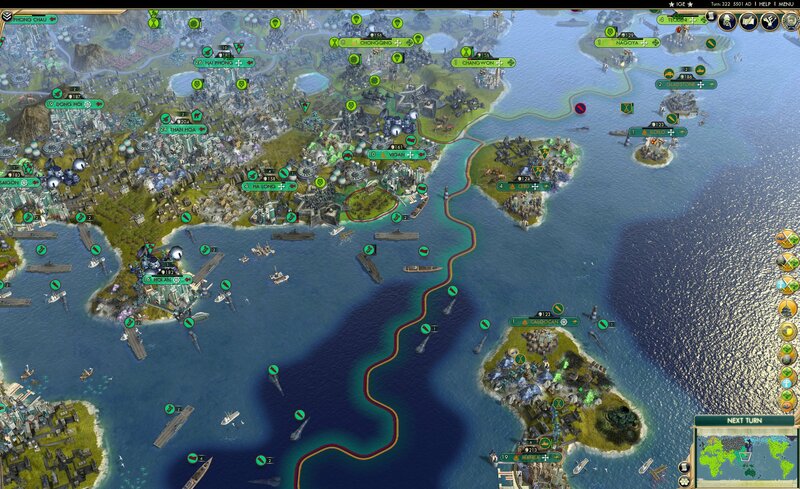 On another note, the city of Ca Mau has been settled, just in time to be captured by CARNIVAL. Australia has one of the largest militaries in the cylinder, but you wouldn’t be able to tell on this slide. 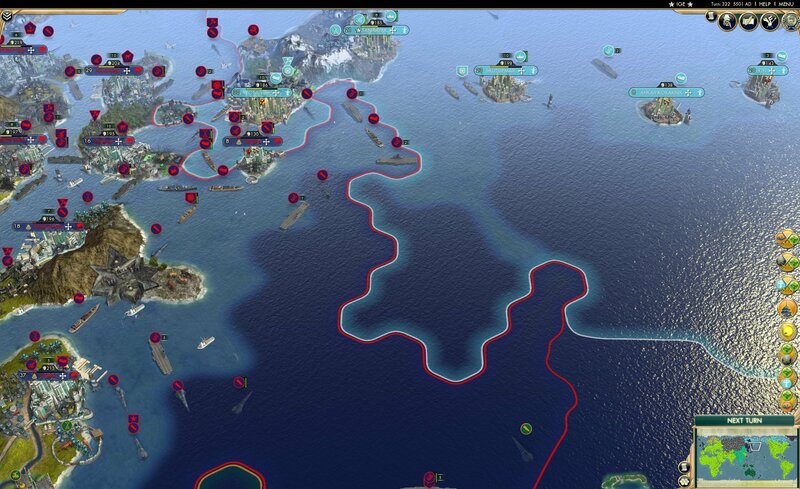 If Vietnam could create some melee ships, (which thinking realistically they really won’t) they could easily take the cities they border on the coast, all of which are in the red. We get a look at Australia’s Antarctic colonies, and it’s looking like Quandan is going to be retaken by Brazilian XCOM’s next turn. 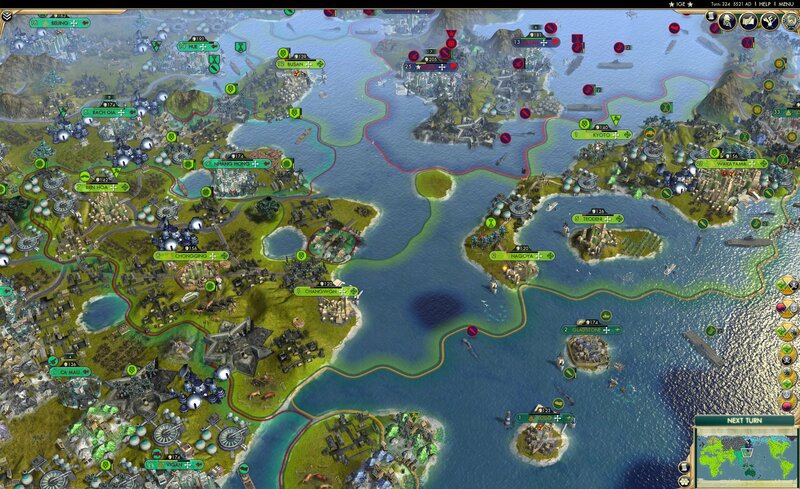 We can also see the southwestern tip of Brazil’s mainland empire, specifically showing off their navy, which if you look hard enough, you will see a single melee ship. I don’t like you Pedro, but I have to admit you’ve got me on this one. 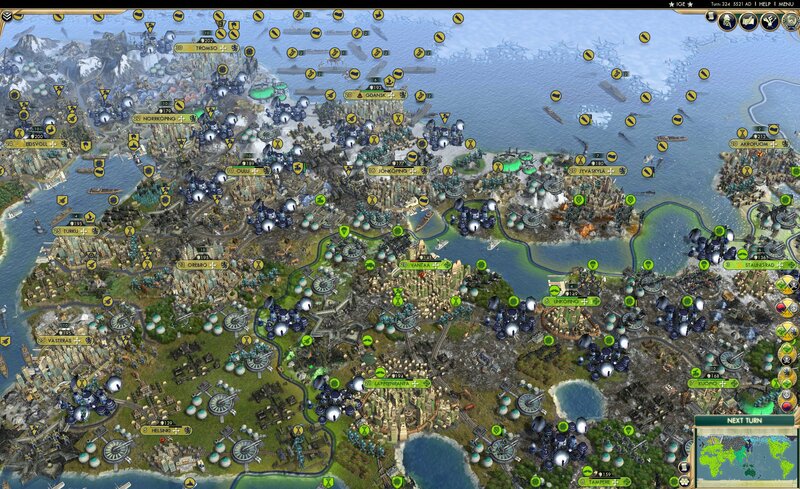 The citizens of Bundaberg begin to feel the pain as Brazil arrives. With a grand total of 4 melee ships, Brazil at this point is completely unstoppable, and will without a doubt capture Bundaberg. Hope those Australians like to dance. 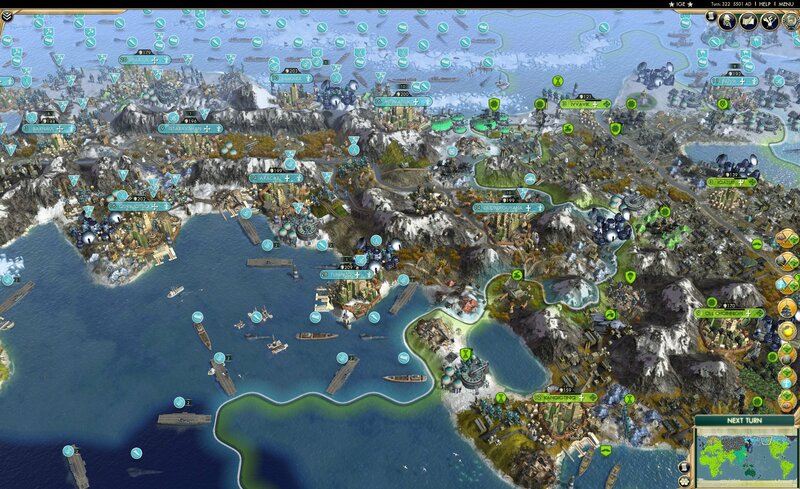 As we move to the Inuit front, the Inuit have done well again in holding off Brazil’s CARNIVAL. With a good carpet, it’s looking like they’ll last for a little bit, but Brazil’s waves of the party never stop. 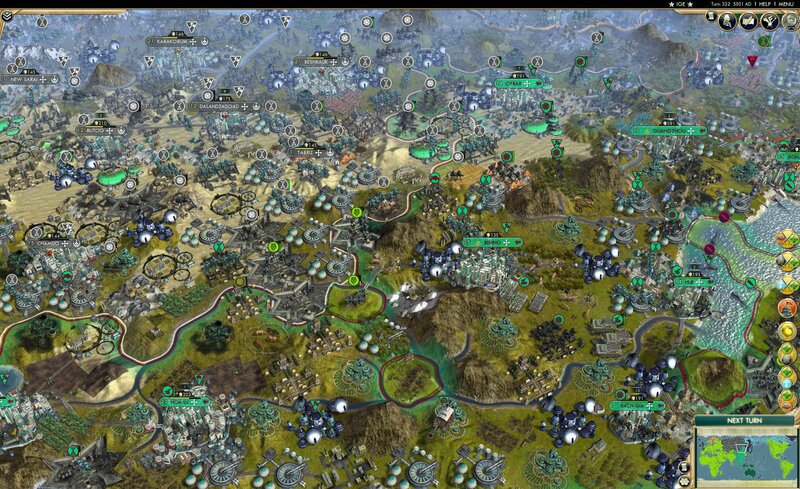 Why exactly are the Inuit holding off Brazil now? Why not, at the start of their war? 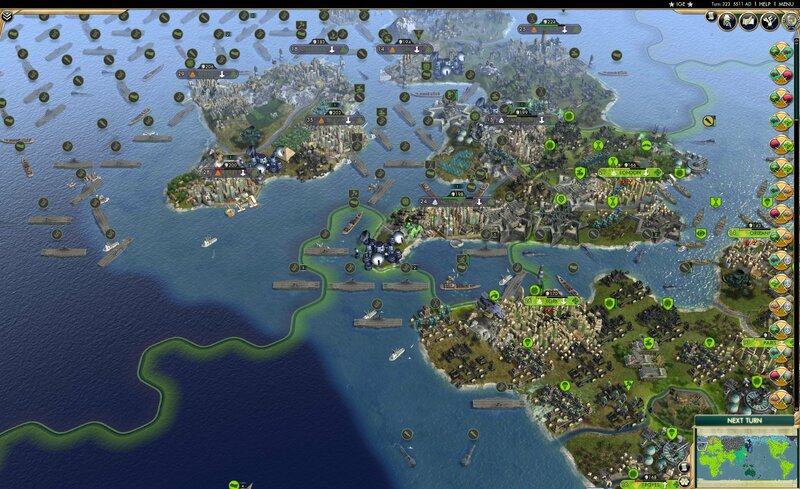 Brazil have captured the city of Saint John, further pushing the Inuit out of southern Canada. They haven’t made any gains on any other Inuit fronts, though. Could they be building up troops for another push? 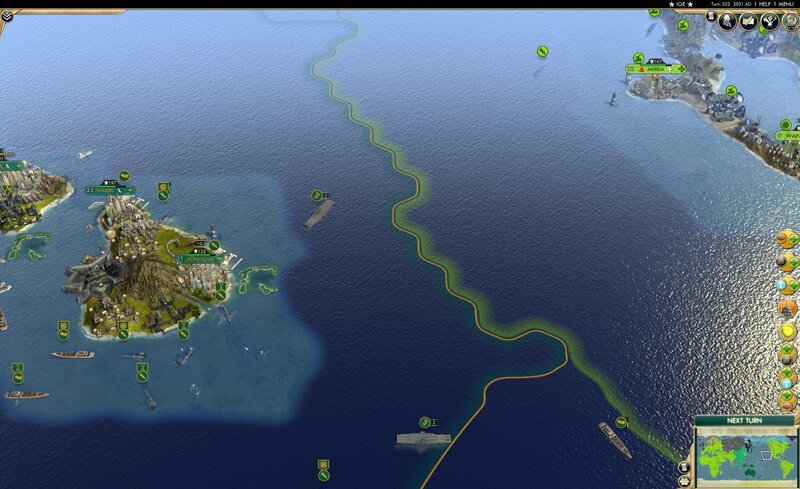 Kleflavík has been captured by the mighty Pedro, with Húsavík looking soon to follow. 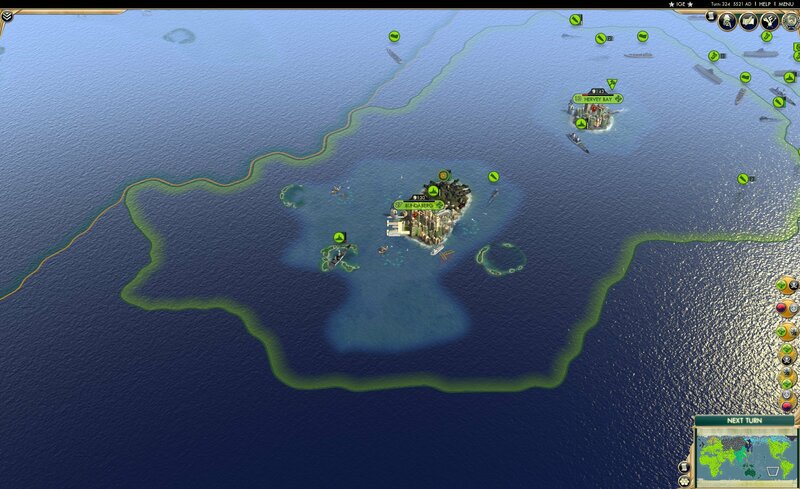 Iceland held the entirety of Newfoundland under Brazilian siege for about 2 turns, and if that isn’t a win, then I don’t know what is at this point. When you really think about it, I believe almost every single slide we’ve seen this part so far has included Brazil. For an upcoming part, we should have a pro-Brazil narrator, and just narrate from the point of view of a Brazilian, providing pro-Brazil propaganda. In the Caribbean, we can really see how badly the Buccs fared this turn. With only two cities left, and both of them in the red, we might all have to prepare our F keys for next turn folks. WOAH! In a huge upset that I actually didn’t see coming, Brazil has taken 4 cities in the western Pacific, from both Australia and Vietnam. 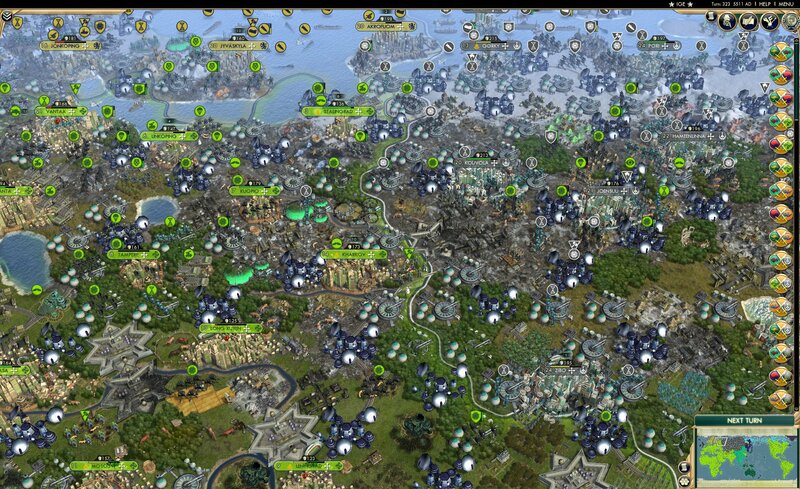 Who knows how many more cities Brazil could take like this, acting as the clean-up crew to other nations duking it out. 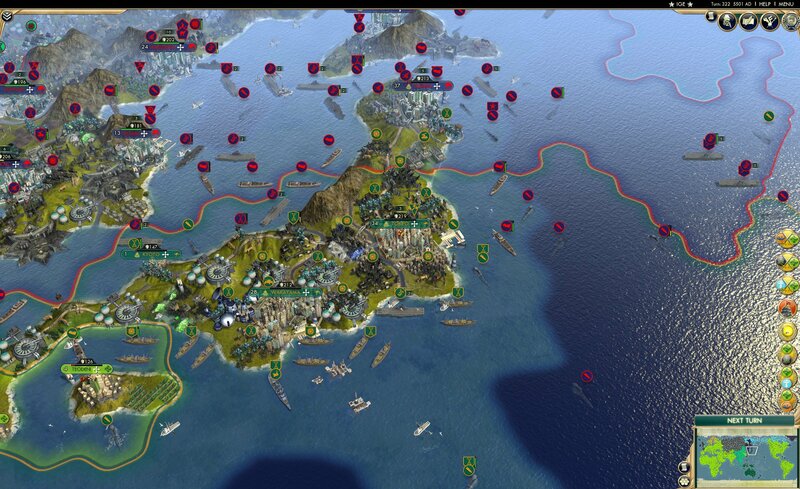 Brazil also captures Kyoto and Wakayama from Australia, and the city of Gwangju has been nuked off the map, by either Korea, Australia, or Vietnam. Who knows. Brazil is starting to make quite some headway into Asia here. The end could be sooner than we all expected. 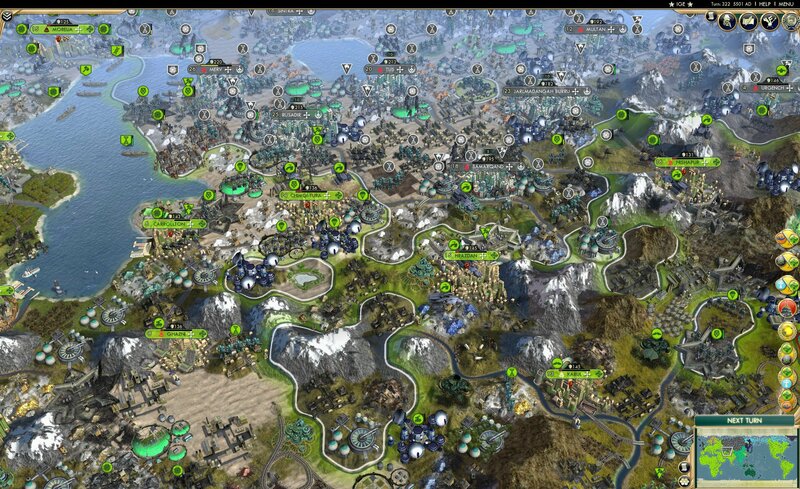 Korean cities gain a bit more health, and hold off from enemy forces this turn. The Koreans still remember Pyongyang in all of its greatness, and fight on another day to remember its name. Brazil still holds Ambarchik, as their forces either prepare for an outward attack, or just wait for the people surrounding them to be surrounded themselves by Brazilian reinforcements. For some odd reason Gongju is the only city in this slide which has full health. A Siberian Robot Infantry captures Phu Xuan, and laughs in robot at the Brazilian XCOM who couldn’t, and the Brazilian XCOM can’t do a single thing to stop it, because it isn’t his turn. Brazilian troops also continue to flow into west Vietnam, and while they haven’t captured cities yet, they sure are bound to soon. Sibir boasts a sizable carpet of units, compared to their neighbor of Vietnam. 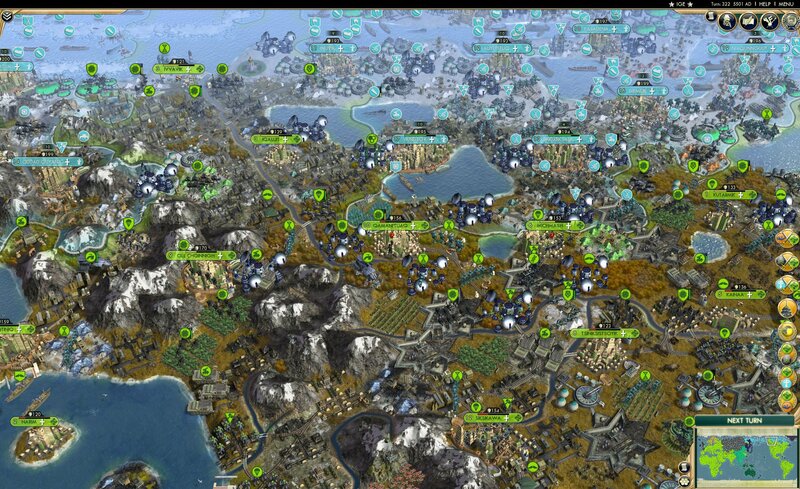 With Vietnam having a total of 3 units to defend Xigaze and Hoa Lu, Sibir stands to make some good gains into Vietnamese territory. 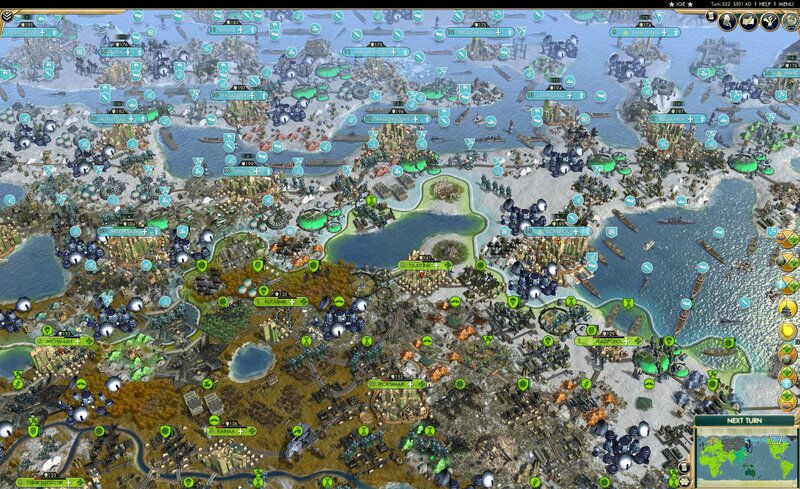 With both Guangzhou and Otrar at or almost at 0 health, it looks like Sibir will capture them soon, causing Vietnam to lose even more cities. I count a total of 13 Vietnamese land units on this slide. That’s only 3 more than Korea, and they only have a snippet of their land in the shot! 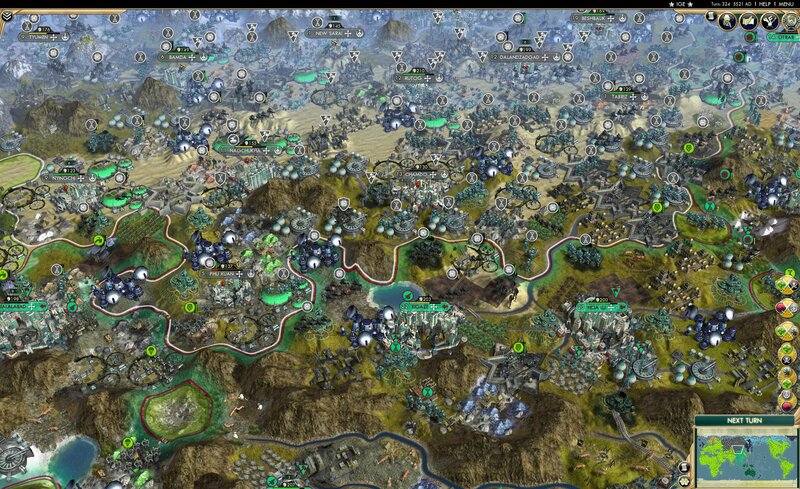 Samarqand and Urgench have fallen to CARNIVAL, but Sibir has enough troops near Samarqand to make me believe they might be able to take it back. That’s just another capital to add to to the ever growing list of Brazil’s capitals. 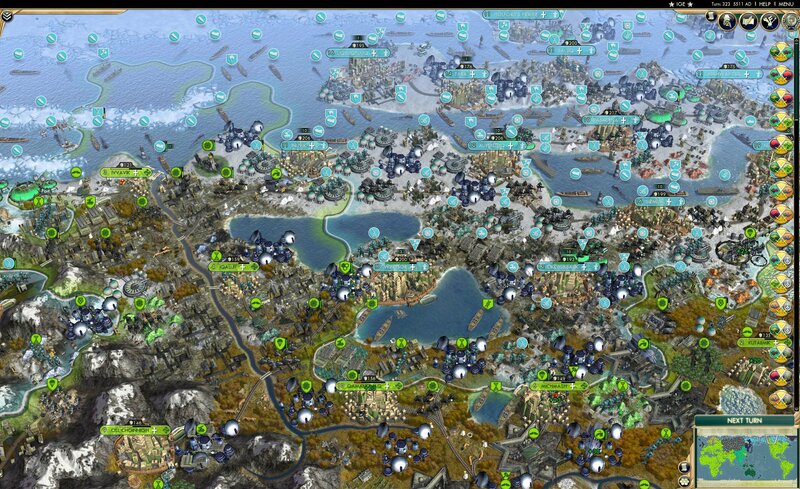 Sibir has a startling low amount of troops on this front. This is the front that you want to be defending, Kuchum. 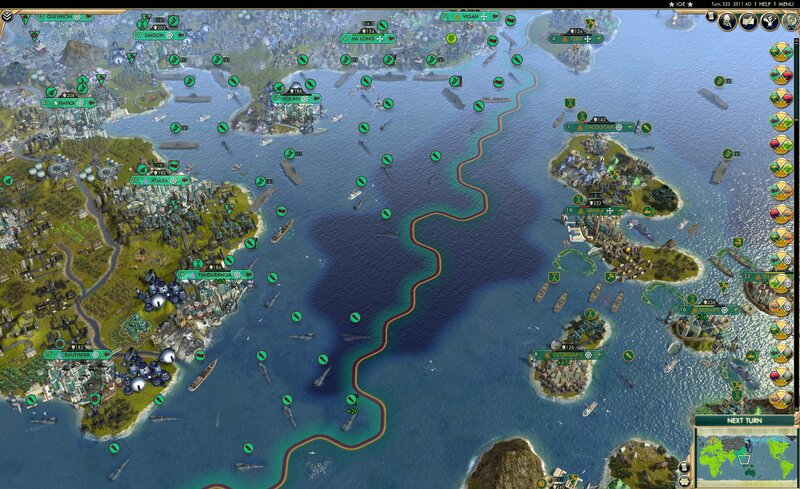 On the contrary, Brazil has a very powerful looking force marching east. With Kouvola having 0 health, it is definitely poised to fall next turn. Sweden manages to not lose any cities on this front here, but you can tell that Helsinki was flipped, due to the resistance in the city. Sweden doesn’t have too many troops, but they are making the ones they do have count. Sweden holds all their cities on this front, as well. 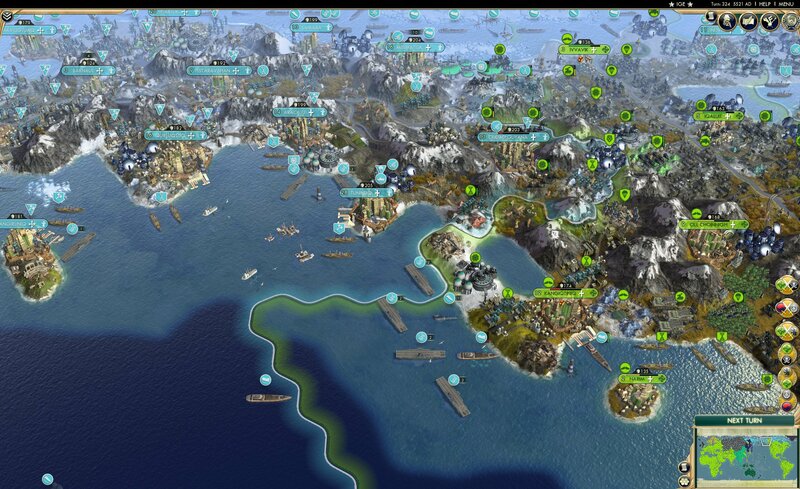 They have managed to pick off most of the Brazilian troops invading Visby, keeping the city safe. This slide shows a whole lot of water, and a fair amount of boats in that water. The Brazilian border to the west is what I assume is from Newfoundland, and all of the Icelandic cities in this slide have been bombed into half health or less. And just like that, the Buccaneers have been eliminated from the game. 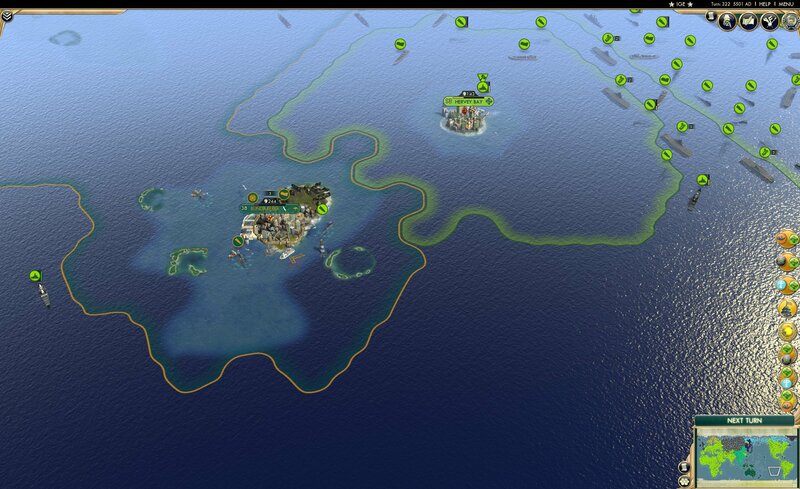 The Buccaneers were arguably one of the most interesting civs to watch in the entire game. They managed to form a trans-Atlantic empire, controlling territory in both Africa and South America, they truly ruled the seas in their prime. But alas, for the Boers and Brazilians pushed them out of their land, and isolated them to small chunks of Central and South America and the Caribbean. The Buccaneers, in my opinion, had probably the coolest looking borders in their prime. Just the combination of Africa, the Caribbean, and South America made for a really nice looking country. 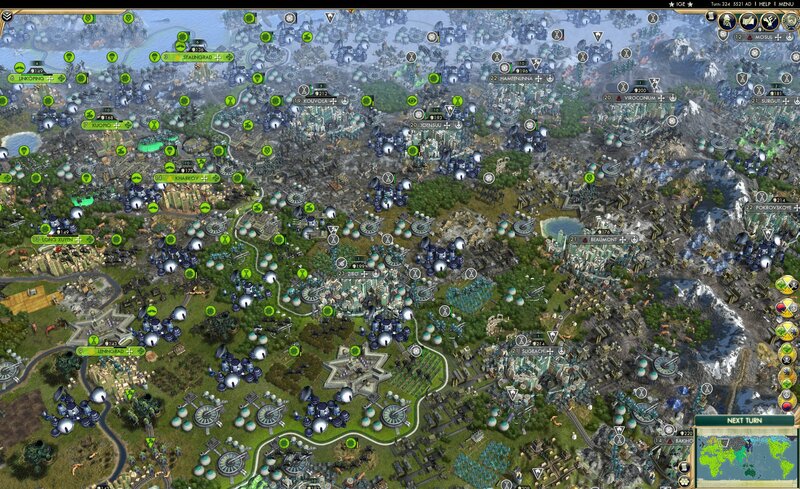 I believe losing Arrrfrica to the Boers was inevitable, but defeating Brazil was a real possibility. Just imagine what the cylinder would be like with a defeated Brazil. Oh, how the world would be different today. And to think too, This turn the Buccaneers and Brazil somehow made peace. If not for total war, The Buccs would have still been alive today. Finishing in 10th place, the Buccs are one of the 10 civs that made it to the top 10. In an upset. many thought the Boers would be eliminated first, due to their absolute lack of strength to defend themselves, but no, it was the Buccaneers. Henry, you absolute madman, never change. As expected, Húsavík falls to the mighty CARNIVAL, and with that Iceland has been eliminated from mainland North America. 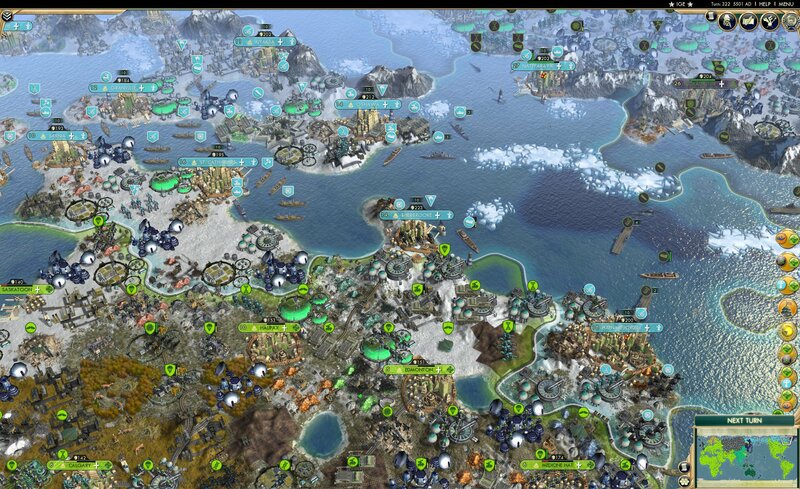 Pedro focuses his troops on Hafnarfjordur, which will inevitably fall soon. 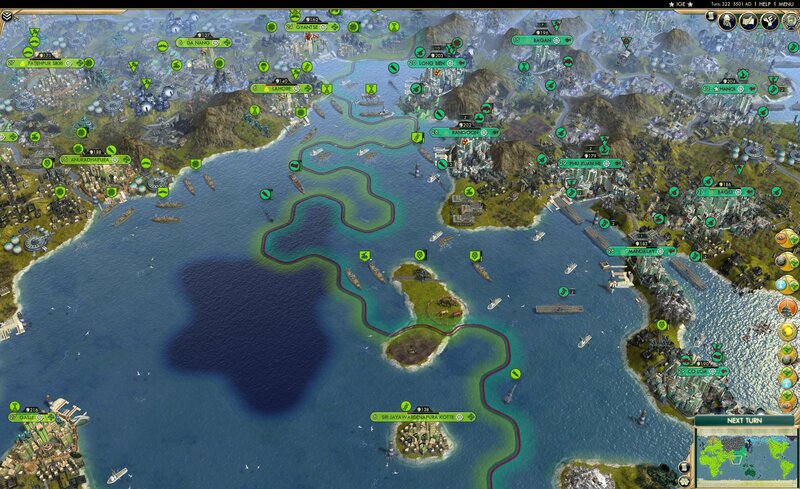 The Inuit somehow hold for another turn, but Brazilian troops are on the offensive. 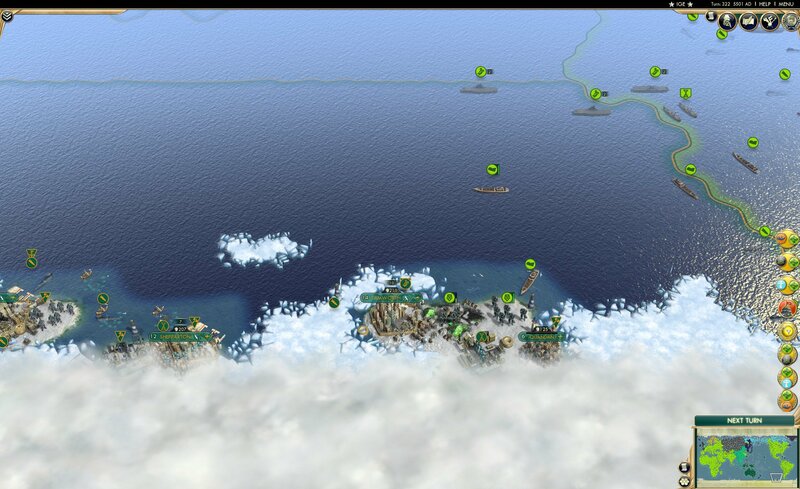 With the Inuit’s large airforce, they may yet be able to hold out for a short while longer. The Brazilian CARNIVAL marches west, into Inuit Alaska. 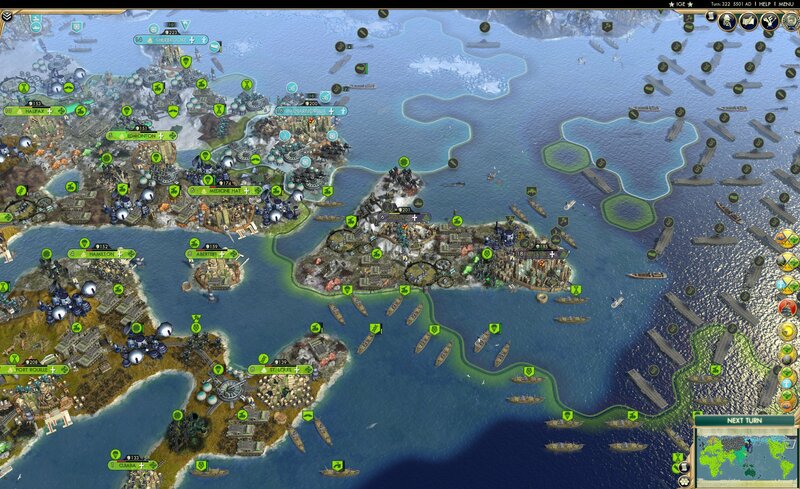 Ekeuhnick sends some carriers down south, appearing to try to retake Kangiqtiniq. THE GREAT BUNDABERG HAS FALLEN! Known for Bundaberg Rum, it seems only fitting that it fell on the same turn as the Buccaneers. As we speak, Brazil is slowly making gains in the Pacific, slowly approaching the Australian mainland. 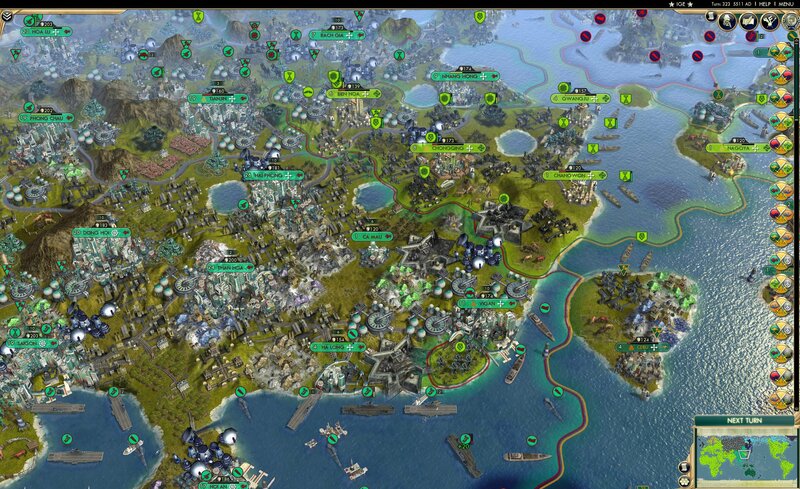 We end this week’s segment of the Civ Battle Royale with the fall of Quandan once again to Brazil, looking to be quite securely in Brazilian hands. Being honest, I feel like this slide is mainly here for the mappers of the subreddit, so they actually know that this city flipped, because I personally know that I never would have noticed. It has been an honor to narrate this part of the CBR, and I hope to contribute even more the community in the future. This is u/Vihreaa, signing off until the next time I narrate, which will presumably be in the CBRX. PS: For all you people wondering about the Boers, they are still in fact alive. With my screenshot of the game being more detailed, I can say with 95% accuracy that the Boers are still alive and honking. Made by el lyss in 2016-18. FAQ, privacy & stuff. Contact. All games.